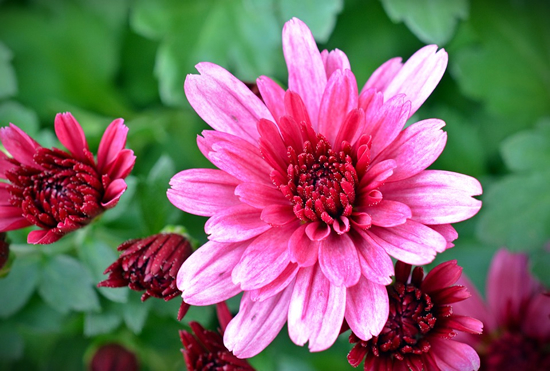 Now in season, Chrysanthemums symbolize optimism and joy! Make it a good week! What is your time going towards? We only have so much time to get the things done in life that matter most. Are you distracted by technology? Are you on your phone too much? Are you spending an excessive amount of time playing video games, watching too much television, or scrolling through social media feeds? This is the time to make an assessment of your time. Creating a schedule that allows time designated specifically for your down-time is recommended. If you intersperse your habits at random through your day, your productivity level will decline and it will take you longer to reach more important goals. With the Sun in Virgo and Mercury Retrograde in Virgo early in the week, it’s a good idea to get real about what is a habitual pattern of distraction in your life, and fix it. Technology and information sharing can be especially strong time consumers that need to be addressed now. Taking stock of your financial picture is especially important with Mercury Retrograde in Virgo. Having another look at your past spending habits is recommended. If you haven’t been tracking your income and expenses, this is the week to make that spreadsheet. Regardless of your financial status, whether you have a lot or a little, responsibly managing your money will help you get your life on track. Fixing previous mistakes and ensuring you don’t repeat them is valuable. Though saving is more suitable than spending now, the urge to mindlessly spend on entertainment and fun is heightened. Gambling with the intention of a big windfall can lead to excessive loss, disappointment and lack of satisfaction. It is more empowering to be grounded, decisive and practical, and more conservative with spending rather than being frivolous. When spending on anything, consideration for long term consequences is recommended now. Virgo is a sign notorious for worry, due to the nitpicky, meticulous, detail oriented way of seeing the world. Worry and stress are a natural part of life, going hand in hand with our survival instinct. But for some, especially when Mercury is Retrograde in Virgo, worry can get out of hand. From biting nails, to sleepless nights, to more serious obsessive compulsive disorders, repetitive, habitual behavior can be formed as a coping mechanism to relieve worries and stress. This week is a good time to have a closer look at what worries are repeatedly affecting your life or holding you back. Working on breaking the cycle, and finding better outlets for stress is recommended this week. Health and wellness approaches are best suited. If you find yourself slipping into bad habits, consciously stop yourself and find a healthier replacement. Instead of biting your nails, perhaps do a downward dog. If you can’t sleep at night because your mind is racing, get up and read a book… The trick is to consciously replace the bad habit with something different and beneficial so you can create concrete, practical changes that matter. Getting rid of clutter and mess early in the week can help reduce worry and increase a sense of personal power. What’s more important to you, talents or skills? Talents are natural parts of your personality and are something you don’t have to think too much about. They are more naturally embodied as a part of you, and are more fluid, creative and inspired. Skills are learned through practice, trial and error, and can usually be developed by most people with enough time and effort dedicated to improvement. They are more logical and structured. But both talents and skills benefit from repetition. The more you express your talents or utilize your skills, the more comfortable and better you’ll get. This week is a good week to address the skills and talents that deserve more of your time. Fixing your schedule so you have more time to focus on developing your skills can be your ticket to professional development. Experimenting and exploring talents that have been hidden below the surface for too long is recommended. However, in terms of talents and skills, this isn’t the best time to hop on a karaoke machine and belt out a song you haven’t practiced much. You could very well end up making a fool out of yourself and the emotional memory could stay with you for longer than you’d like. Creative types should find themselves getting extra inspired by all types of arts and entertainment this week. Vintages will have a greater appeal on the senses too. Mercury Retrograde leaves Virgo and re-enters Leo on August 31, 2017 at 11:32 am ET. 5. What did you say? Gossip can get overheated. Fire and Air dominate this week’s activity. Emotional reactions can easily sway behaviors and responses. Mars and Uranus connect on September 2, 2017. Issues surrounding ego, identity, personality and behavior can lead to impulsive, automatic, surprising actions and reactions. This is not a good time to gossip about friends, acquaintances, or especially enemies. Saying the wrong thing at the wrong time is highly likely. Talking behind someone’s back is likely to stir up dramatic issues and could lead to combative responses - verbal and even physical depending on who it is. If the intention of gossiping about someone is based on trying to get another to side with you, it could very well backfire. Opinions formulated on hearsay can get messy. If what is said has weak backing and lacks concrete information, an opposing response could easily shake things up. Not only is talking behind someone’s back likely to get under people’s skin easily, but it could create an extended drama that you just don’t need in your life. Silence can be your best response when anger, irritation, annoyance are dominant. Secrets are less likely to be held in confidence as the urge to talk behind the scenes is heightened. In all communications this week, when talking to people, it is not just what is being said that is important. Making sure others understand what you are saying matters most. Mercury Retrograde enters Leo on August 31, 2017 and Mercury meets Mars in Leo on September 3, 2017. Aries: Creating the life you want and being the person you want to be requires time, willpower and dedication. An active pursuit of your goals defines your experience. However, there can be countless distractions that take you off course. This week, take another look at your habits and patterns to see how much time is wasted vs. how much time is prioritized on better options. This week can define keys to making improvements. Working on goals that encourage long term freedom is the foundation of good things to come. Taurus: Getting rid of clutter is a gateway to a greater sense of personal freedom. Whether it is physical objects that get in your way, or people and personalities that are obstacles to your happiness, making time and space for your wants and needs is recommended. It’s a great time to do some redecorating and finish up details of renovations to give you a sense of comfort at home. Miscommunication with family and those close could get heated. Active listening can help calm flames. Also be extra careful of machinery, and be sure that you are clear on how to use tools properly and safely. Gemini: Computer, phone and other technical issues are possible around home and the office early in the week. If something is persistently not working, rather than obsess with frustration, perhaps you’re getting a strong sign to take a break and reroute your focus in another direction. Gemini’s are known for wanting to know all the gossip and dishing plenty out, but this week you may need to hold back to minimize the risk of fanning flames. Misinformed opinions relating to friends, acquaintances, siblings and cousins can be especially risky. Speaking well can set you up for much better relations and longer-term benefits. Cancer: Rules and roles can play an important part in your relationships this week that change the way you feel about others. Miscommunication can impact your day to day routine and lifestyle so double check your schedule, date and times. It’s not a good time to gossip and nitpick at issues. The potential for big, dramatic responses can get people worked up. It’s more important that you focus on the changes that need to be put in place regarding your financial picture and income. Look at your past income and assess if it has met your wants and needs and consider a variety of possible adjustments. Your income take make a jump if you are willing to renegotiate the details. Leo: You are now in a growth phase, but Mercury Retrograde is coming back to your sign this week. First, you should make sure you are on top of your financial picture. Then it’s time to get more focused on the real you. Your determination to use your life well, and be all that you are capable of becoming is a significant highlight this week. It’s likely for Leo that parts of who you thought you were, isn’t who you really want to anymore. Your priorities are changing, and your sense of identity can go through a revolution this week. You could feel like a rebel, but positive self worth as the foundation of your decisions, actions and reactions will guide you best. Virgo: Mercury is Retrograde in your sign early in the week which has you reevaluating your life. It is your habits and lifestyle that especially define you now, so assess how you are using your time. If you are a worrier, acknowledging your repeating negative thoughts is recommended. If you are consistently hung up on particular issues, it could be damaging. Try not to be obsessive. Though mindless distractions can pull you off course, positive and mindful distractions from unnecessary worry can be beneficial. Getting back in touch with your creative dreams, imagination and fantasies can be an important part of waking you up so you don’t keep repeating inept cycles. Random words or phrases can stand out this week in music, movies or magazines that lead to a key realization. Libra: You benefit from having an open mind, especially among those that need a larger point of view. You could stand out as having solutions to problems other people just can’t figure out. Diving deep into your imagination and accessing your higher faculties can shift the direction of your mind. Look at both the big picture and the small details for best results. You could revisit or reconnect with acquaintances, friends, mentors or role models. Entertainment and creative arts can shift your perspective and motivations. Sharing the love with good people makes life more fun for you. Scorpio: Emotional, knee-jerk reactions are not your best option this week, but it could be difficult to stop them. Mixed thoughts and feelings can bring lots of drama from passion to fury. Your career could be where the action is most notable. Reputation is a big concern, so do try to put a muzzle on it if blood is boiling. Miscommunications and misinterpretations are highlighted with Mercury Retrograde now so do your best to clarify in simple terms whenever confusion is noticed. If you can bring softness and creativity to matters of career you could attract more rewarding opportunities. Sagittarius: Saturn is now direct in your sign. The changes in your life could come on slowly, and the way you perceive yourself is going through an overhaul and renewal, but you’ve got blessings on your side this week. Other people could remind you of better choices. Discussing pros and cons with those you trust can get you on the right and balanced footing. Early in the week is best suited for a review of your career and lifestyle direction. As the week continues it is your higher aims, and the reasons for them, that deserve a review. Creativity of all kinds, including entertainment, can be your best teacher now. Ask and you will learn. Capricorn: Your long-term transformation is peppered with many minor adjustments. This week is a good time to review the larger picture and your higher aims, along with the finer details. Where are you wasting time and misdirecting your time and energy? To get where you want to go, you’ll need to assess how the day to day process impacts the longer range outcomes. The stepping stones are as important as the big vision. Looking at your financial resources, and where you’ve perhaps made mistakes in the past regarding debts and borrowing, can help you minimize future risks. Revisiting long lost talents can bring you the right inspiration you need now. Aquarius: Reevaluating financial issues related to your lifestyle choices is recommended this week. If you are worried about debts, this is the time to get honest about a change of direction for your life. Reinforcing good habits and doing away with the ones that drain your time, money and energy is essential now. Reassessing your relationships will become more important as we head into the middle and later parts of the week. Miscommunications can change everything so be sure that you are as clear as possible and listen well. It is essential that you remember that your point of view isn’t the only one that matters. If egotism dominates, dramatic responses are likely. You can expect the unexpected in relationships of all kinds this week. Pisces: Are you reserving your time and energy for the right kind of relationships? Are you using your life energy to serve people you genuinely want to be of service to? This is a good week to reevaluate priorities, especially regarding the types of people you associate with and how much time you dedicate to others. Your lifestyle also deserves a creative reawakening now. Revisiting places that you know have inspired your creative mind can do you wonders. Nurturing your talents this week can set the stage incredible thoughts. Music, movies and leisurely pleasures can give you a major boost of ideas and rekindle your desire for a creative lifestyle. Vintage shops can reignite interest and passion for life.